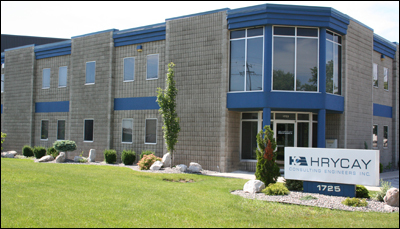 HRYCAY Consulting Engineers Inc. (HRYCAY) is an independently owned and operated consulting firm headquartered in Windsor, Ontario, Canada, directly across the Canada / UnitedStates border and minutes away from Detroit, Michigan. We have branch offices in Guelph, Ontario and Dartmouth, Nova Scotia to better serve our GTA and Atlantic coast clients. Incorporated in 1988, HRYCAY provides engineering services in the areas of transportation safety including civil and municipal design, motor vehicle accident investigation, engineering analysis of motor vehicle accidents, download and interpretation of vehicle on board data recorders, computer simulations, and 3D scientific visualizations and animations. The HRYCAY firm has become specialists in the area of heavy commercial truck accident investigation and engineering analysis and is recognized for their expertise across North America in this area. HRYCAY's services have been requested in all 10 Canadian Provinces and one of the Territories as well as in 48 individual States throughout the United States. Our engineers have been qualified and have given expert testimony in Court in multiple States and Provinces and have also testified at Deposition in many of these jurisdictions on behalf of our clients. This broad geographic exposure has allowed us to experience and adapt to the ever changing technology as it relates to our business.